LG is making a real war versus Samsung’s new flagship phone. 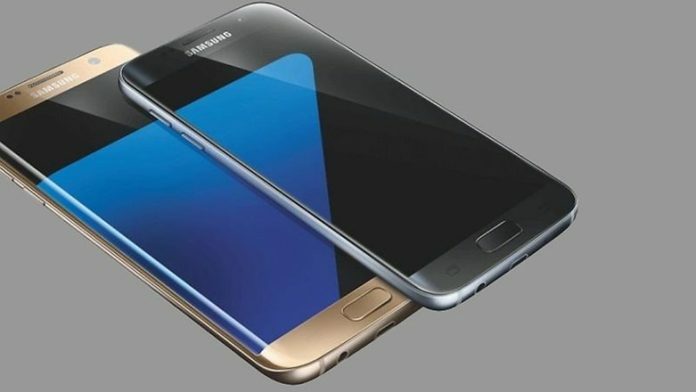 Samsung Galaxy S7 is the evolution of the previous S6 series announced latest year by Samsung at Mobile World Congreess. This years Samsung and LG have both announced their premium phones on February 21 and the competition started because the two company have fighted to achieve most users interests. As usual, we don’t care about these useless things because we are interested in products and not about producers market. 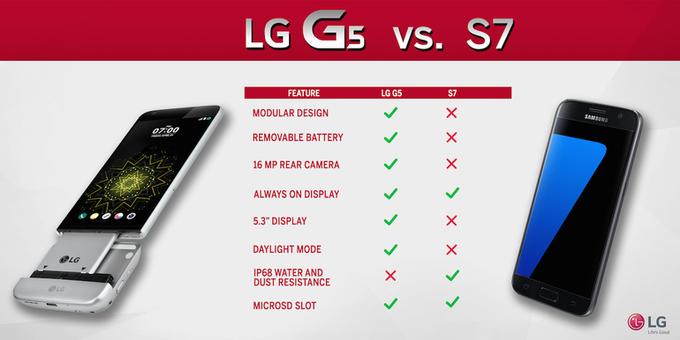 On the latest ad, LG shows off a new table that shows a comparison between the Samsung Galaxy S7 and the LG G5, the LG achieve the best results if compared to the S7. Obviously the comparison has been generated by LG and as expected the competition imposes that a product must be eulogized for its specs, but what LG says is not as real as seems to be. LG says that the G5 is better because of modular design, ok that’s interesting especially if we consider that LG G5 has a full metal frame, built with a unibody factor. This is the only device to feature the Magic Slot that allows you to remove battery by simply pulling this metal module that stores the battery. Next, the camera. Samsung has increased the pixel size of his camera by reducing the pixel density for the Exmor Sensor that now is about 12 Megapixel defined. This camera also feature a Dual Pixel configuration that enhances the autofocus time by using the 100% of all pixel to define the image. The new lenses are now optimized even in low light condition thanks to the improved aperture that now is f/1.7. LG asserts that its camera is better because it’s more defined, for now, we can’t say nothing because we haven’t tested these two phones, but usually having a more defined camera doesn’t mean that photoes are captured better. The display is one other point. LG uses an IPS Quad HD display that feature the Always On feature, the Samsung Galaxy S7 makes use of a Super AMOLED QHD screen that can be Edge if we consider the Edge version of the S7. All in all, we can’t consider a phone watching a simple infographic like this, this is because both these phones are great and we’d like to try them before giving personal considerations. Previous articleHTC teases the next HTC One M10. What to expect from the next flagship phone?